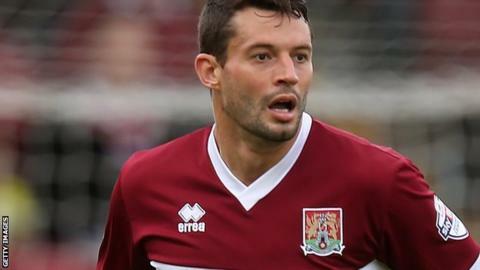 Marc Richards' first-half double sealed victory for Northampton over Dagenham. Kaid Mohamed's square ball found Richards, who coolly slotted past Liam O'Brien to give the visitors an early lead. Richards added a second when he headed low beyond O'Brien from Joel Byrom's corner. The Daggers posed little threat, with Luke Howell's 25-yard effort pushed over the bar by Matt Duke proving to be their best chance of the afternoon. Match ends, Dagenham and Redbridge 0, Northampton Town 2. Second Half ends, Dagenham and Redbridge 0, Northampton Town 2. Corner, Dagenham and Redbridge. Conceded by Joel Byrom. Attempt saved. Lawson D'Ath (Northampton Town) right footed shot from outside the box is saved in the centre of the goal. Substitution, Dagenham and Redbridge. Mason Enigbokan-Bloomfield replaces Matt Partridge. Corner, Dagenham and Redbridge. Conceded by Ben Tozer. Substitution, Northampton Town. David Moyo replaces Marc Richards. Attempt missed. Bradley Goldberg (Dagenham and Redbridge) right footed shot from outside the box is too high. Corner, Northampton Town. Conceded by Matt Partridge. Corner, Northampton Town. Conceded by Liam O'Brien. Attempt saved. Lawson D'Ath (Northampton Town) right footed shot from the right side of the box is saved in the top centre of the goal. Attempt missed. Kaid Mohamed (Northampton Town) left footed shot from the left side of the box is close, but misses to the left. Corner, Dagenham and Redbridge. Conceded by Ryan Cresswell. Bradley Goldberg (Dagenham and Redbridge) wins a free kick in the defensive half. Attempt saved. Ashley Hemmings (Dagenham and Redbridge) right footed shot from outside the box is saved in the top centre of the goal. Foul by Bradley Goldberg (Dagenham and Redbridge). Nathan Green (Dagenham and Redbridge) wins a free kick on the left wing. Substitution, Northampton Town. Lawson D'Ath replaces Chris Hackett. Corner, Northampton Town. Conceded by Abu Ogogo. Corner, Northampton Town. Conceded by Brian Saah. Substitution, Northampton Town. John-Joe O'Toole replaces Ivan Toney. Substitution, Dagenham and Redbridge. Nathan Green replaces George Porter. Substitution, Dagenham and Redbridge. Bradley Goldberg replaces Luke Howell. Attempt missed. Ashley Hemmings (Dagenham and Redbridge) right footed shot from outside the box is close, but misses to the left.